This was a creation on a whim. I wasn’t in the mood to cook (oh yes, this happens even to me) and Todd was coming home in 30 minutes. I needed something quick to make. I opened my freezer and saw the homemade Mexican chorizo I had made and frozen a few weeks ago. I also had some butternut squash that needed to be used. Chorizo and butternut squash…I figured the cinnamon accents and spiciness of the chorizo would complement the sweetness of the squash. I opened one of my pantry closets and a big bag of green lentils immediately caught my eye. A perfect ingredient to bind the other two together. I sauteed some onion and garlic in olive oil and browned the chorizo in it, added the diced squash and let it caramelize a bit, then added the lentils, a little celery, some chicken stock, a bay leaf, freshly ground pepper and salt, and some…why not?…curry powder (I reasoned that the cinnamon in the chorizo would complement the curry. And it did.) This simmered for a while and my kitchen was soon filled with a lovely sweet and spicy aroma. I added some Swiss chard in at the end for some added color, texture and nutrition. It was delicious! AND here is another use for that wonderful homemade Mexican chorizo! 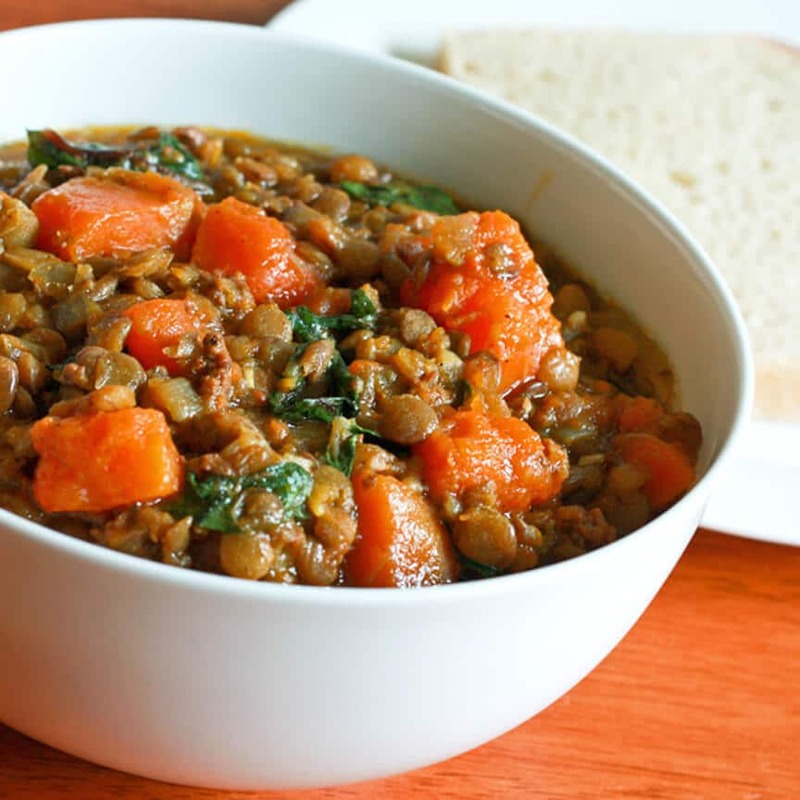 A union of Mexican and Indian flavors in a hearty, satisfying lentil stew. 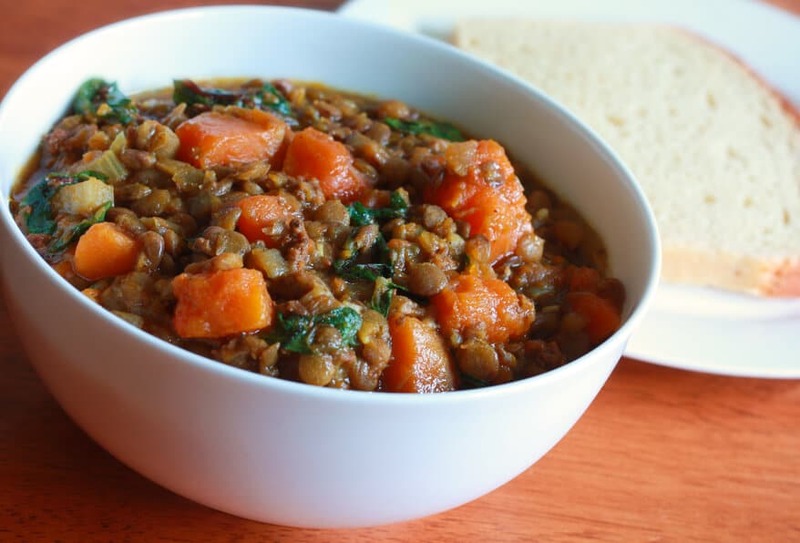 In a Dutch oven, saute the onion and garlic in olive oil until translucent, add the chorizo and brown, add the squash and celery and saute for another 2 minutes, add the lentils, stock, bay leaf, curry powder, and salt and pepper. 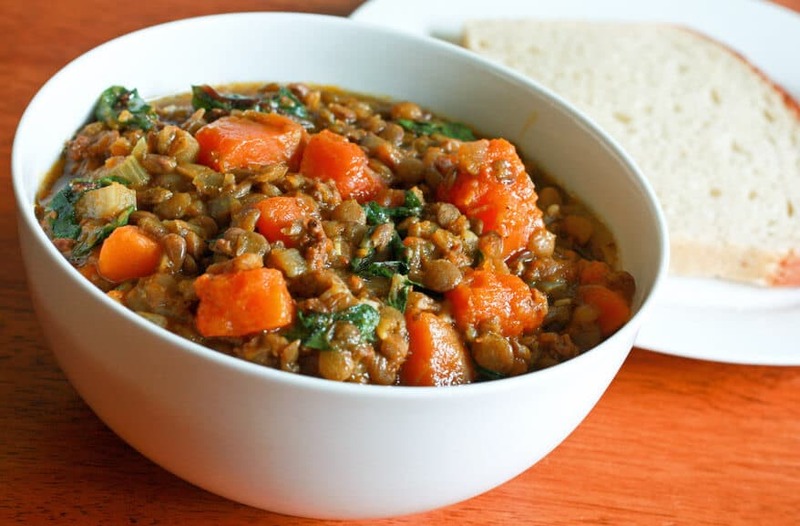 Bring to a slow boil, reduce heat to low, cover and simmer for 20 minutes or until the lentils and vegetables are soft. Add the Swiss chard and cook for another 3 minutes. Serve hot. Thank you, Hari, and you’re very welcome! This sounds absolutely wonderful! I just happen to have the right amount of chorizo in my freezer and just bought some green lentils… I’m definitely going to try this this week! Perfect! Have you been treating your husband to his accustomed favorites lately before you venture off into something new and experimental? :) This was an “experimental” stew for sure – we really enjoyed the results! Let me know how it goes. I just made this tonight and it was wonderful, except for one thing: I had some good, locally-made Mexican chorizo, and I had forgotten that the longer you cook hot peppers, the hotter they get. So this dish was really, really hot!! Next time I will brown it separately and add it at the end, if I use commercially made chorizo. I did use more chard than the one cup, and used garam masala instead of curry powder (I thought that would be good, and only later did I discover that I have no curry powder in the house). :-)) This may have been an experiment but it was a very nice one. I do try to make sure I don’t overdo the new recipes for my husband, but he is generally a pretty good sport, as long as I’m not doing Thai dishes. We’ve decided that for the other half of this recipe we are definitely having beer with it (any excuse will do…). Glad to hear it was a success! I am surprised to hear though that such a small quantity of chorizo resulted in such a spicy hot stew. The store-bought Mexican chorizo that I’ve tried has always been very mild – almost sweet. Same with my homemade chorizo. I suppose there are spicy hot varieties as well, which you evidently had the [mis]fortune of using ;) In any case, spicy and all, I’m glad you enjoyed it! This recipe is super delicious! I found it in University three years ago, and it is still my all time favourite soup. Wonderful, Sharifa, I’m so happy to hear that, thank you!